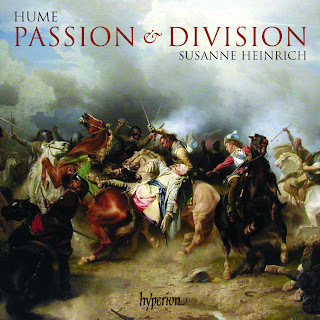 "Susanne Heinrich’s first solo release for Hyperion was a deliciously atmospheric award-winning disc of music by Abel. 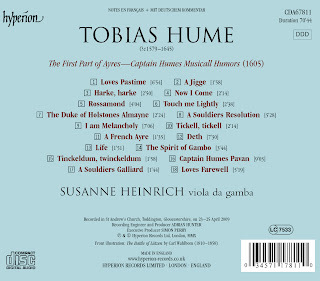 She continues her exploration of the world of the viol with this fascinating selection of works by the English composer Tobias Hume. Hume is a paradoxical figure: sometime mercenary solider and popularly described as a dilettante, the suggestive titles of some of these pieces reinforce that picture — a picture that is belied by the music itself. Many of these works show a deep understanding of pure, translucent emotion, as if to take a magnifying glass straight to the core of one’s feelings. A sense of melancholy and sadness, enhanced by Heinrich’s sympathetic playing, entices the listener into a world of dark enchantment." Thank's, but the link to part 2 and part 3 is the same! Thanks for quick report Tom. It's fixed. Danke schön, Edmond. Brilliante Musik, wie immer in deinem Blog!